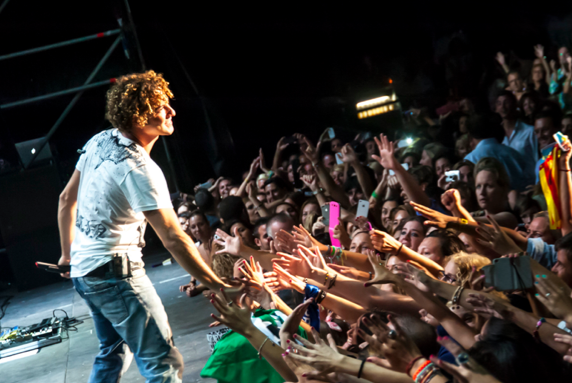 David Bisbal gave his only concert in the auditorium of Marbella on the 23rd of August. David Bisbal gave a fabulous and energetic concert to the audience who surrendered him in the auditorium in Nagueles. He is the most international Spanish artist in the last decade and, today, one of our best universal singers, with over 5 million albums sold worldwide. After two years of intense touring Spain, Latin America, USA, Canada and major European capitals such as Paris and London, and after performing 128 concerts for over 300,000 people, David Bisbal put an end to this 'David Bisbal acoustic' concert with two live in Buenos Aires. Among the attendees were Manuel Martos with his wife Amelia Bono, Carmen Lomana, model Raquel Rodriguez, Lara Dibildos, Elena Tablada and Eugenia Martinez de Irujo.